TVVP Telangana Vaidya Vidhana Parishad. There are total 200 vacancies in this Telangana PSC Recruitment of Lab Technician Jobs. Online applications for this TSPSC Lab Technician Jobs will be accepted from 23-12-2017 to 24-01-2018. Candidates who are intermediate with Diploma in Lab Technician Course or B.Sc MLT course they are eligible to apply for this Lab Technician Jobs in Telangana PSC recruitment 2018 notification. Candidates selection for this Telangana PSC Lab Technician Jobs will be through written examination which will be conducted in the month of March 2018. Written test will be online mode only. 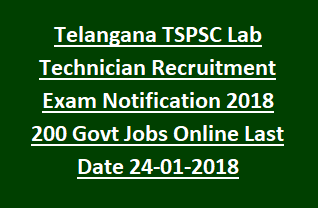 More details regarding this Telangana PSC Lab Technician vacancies, important dates, exam pattern, online application procedure and other details are given below. There are total 200 LT vacancies in this Telangana PSC Recruitment 2018 Notification. Age limits calculation date is 01-07-2017. Age limits are 18-44 years for General candidates and for SC/ST/BC candidates age limits are applicable up to 5 years. Intermediate qualification with Diploma in Medical Lab Technology or B.Sc with MLT qualified candidates are eligible for applying this LT vacancies of TSPSC. Examination fee is Rs.80/- and processing fee is Rs.200/- for this LT jobs of TSPSC notification. Candidates selection will be based on merit in written examination which will be conducted in the month of March 2018. Weightage for written exams marks are 70% only. 30% of Weightage will be given for candidate experience. Written exam will be conducted for 150 marks which consists of one paper. Written exam is objective type only and exam duration is 150 minutes. Total 150 questions will be given. Every questions carries one mark. Online applications only accepted for this LT vacancies recruitment exam of Telangana PSC. Last date for online form submission of 24-01-2018 through Telangana PSC official website of tspsc.gov.in. Candidates who are having the experience they will be preferred at the time interview. Weightage for Lab Technician work experience is 30%.